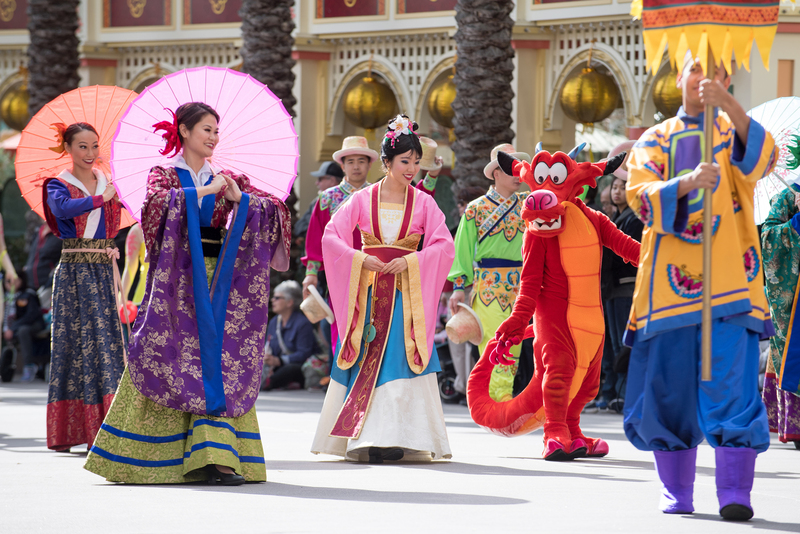 Mulan's Lunar New Year opened last Friday, January 26 at Disney California Adventure, and the 2018 event is bigger and better than ever. Check out Mulan's Lunar New Year at Disney California Adventure article from Friday to read about the history of Lunar New Year, and see photos of past celebrations. Pluto is featured on banners and merchandise this year, apropos for the Year of the Dog. Photo by Todd Pickering. Predictions from that article were spot on, and Disney did not miss the opportunity to tie in the The Year of the Dog with some famous Disney dogs. Pluto is the official mascot for the 2018 celebration, and appears on a variety of event merchandise. You can also spot him roaming the Paradise Gardens area throughout the day. Goofy also has a featured role for this Year of the Dog, but you have to look for him in Mulan's Lunar New Year Procession (check those handy-dandy Entertainment Guides for the show times). As for the Cruella DeVil prediction, it appears that Disney is keeping her far away from this event. 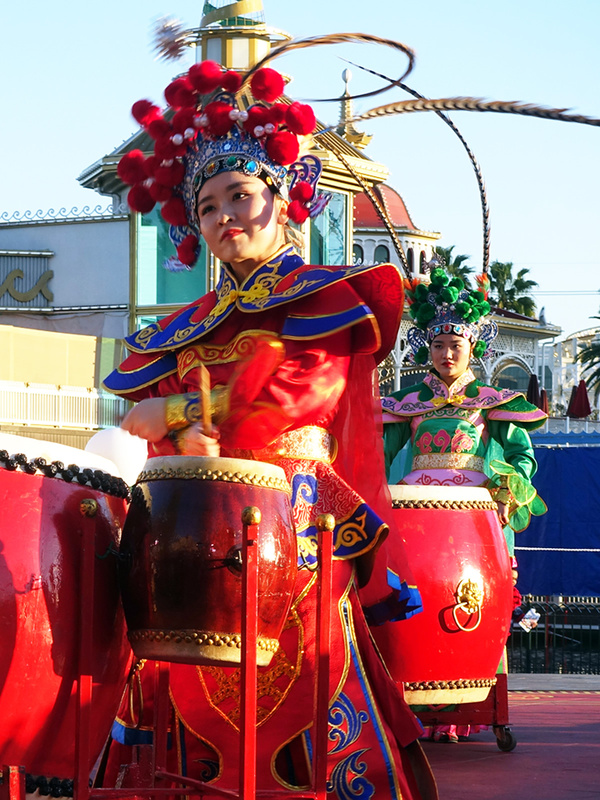 Disney has really done a fantastic job in celebrating the Year of the Dog, and it's worth a visit to soak in all of the color, music, and entertainment. The Lunar New Year is Friday, February 16 this year, and we expect the final three days of Lunar New Year celebration to be the most crowded. Disney's festival runs through Sunday, February 18. Here are our top tips and can't-miss moments from the opening weekend. The women open up the set with beautiful costumes and a razor-sharp intensity. Photo by Todd Pickering. New this year all the way from Shanghai are the GuGu Drummers. The women of the talented performing group kick off the show as they take the stage wearing beautiful costumes accented with very long bird feathers. They drum with deep intensity, following the cues of the lead performer. It isn't just drumming, but a lyrical performance filled with beautiful and flowing movements, with the women pulling on their feathers to create a a pulsing and undulating visual punctuated with yelps and cries. The GuGu Drummers perform at Disney's Lunar New Year celebration. Photo by Adrienne Vincent-Phoenix. Next, some of the men take the stage to tell the comical tale of mice and a cat using all sorts of percussion. Their facial expressions and choreography are sure to put a smile on your little one's faces. The show runs about 30 minutes, which may tax the patience of younger viewers, but be sure to stay for this section. The story of a cat is easily understood, and it is fun to watch the performers' amazing expressions. Photo by Todd Pickering. The final two acts use two sets of massive drums, with performers jumping and leaping between drums as the energy builds. The final act adds vocals, with men singing the plight of the working fisherman along with drumming. The mournful tones of the lead singer fill Paradise Park and echo all around. This new performance is a gem and shouldn't be missed. The GuGu Drummers from Shanghai kick off Disney's Lunar New Year Festival. Photo by Adrienne Vincent-Phoenix. The GuGu Drummers take a bow at the end of their performance in Paradise Park. Photo by Adrienne Vincent-Phoenix. The amazing Vietnamese performer Dat Nguyen returns this year. His demeanor is so cool and calm you almost feel that when he says "Sing along if you know the words," you may be able to sing in Vietnamese. His fingers move on the guitar and lute with such skill and artistry he could keep up with any classical guitarist. Nguyen performs songs with different styles and tempos, and uses a number of different instruments throughout the show. His songs are set to backing tracks that complement his playing wonderfully. His set contains such varied themes and styles from a bouncy song about a spring wedding, to a love song that is more traditional, to a folk song that is a Vietnamese New Year anthem set in three-time with a lovely waltz beat to it. The performance takes place at the Paradise Garden Bandstand. Our tip: check your entertainment guide for show times, and arrive about 20 minutes early to order dinner from the nearby Paradise Garden Grill. Your meal should be delivered in time for the performance, giving you a lovely dinner and a show. Tables in front of the stage are limited, but the area's acoustics are fantastic, and you'll be able to hear the performance wherever you sit. Dat Nguyen performs with three different instruments at Paradise Gardens Stage. Photo by Todd Pickering. 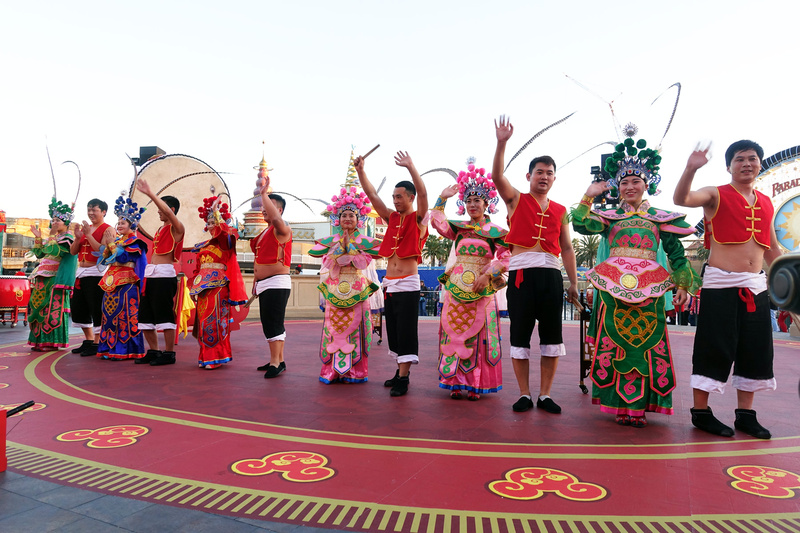 A troupe of Taiwanese dancers joins Mulan's Lunar New Year Procession for 2018, along with Goofy in a new Lunar New Year costume. This processional is again staged near the Paradise Gardens area in the parade corridor, and prime viewing spots fill up fast. Try to catch an earlier show, as the final performances tends to be the most crowded. Mulan and Mushu star in Mulan's Lunar New Year Procession at Disney California Adventure. Photo © Disney. 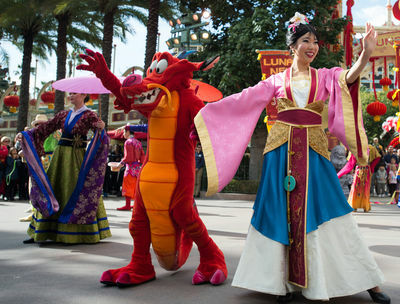 Mulan and Mushu wave to the crowd during Mulan's Lunar New Year Procession at Disney California Adventure. Photo © Disney. 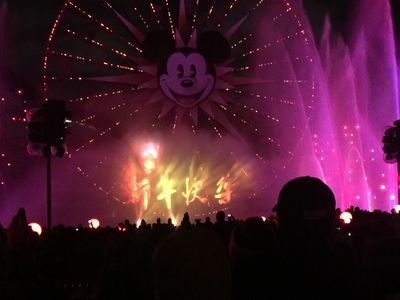 During the World of Color pre-show Hurry Home, you see the tale of a little lantern hurrying home to be with his family in time for New Years, and getting side tracked by that trickster Mushu. At the end of the presentation there are fireworks and a fun graphic of a barking dog before the fireworks begin. Hurry Home. MousePlanet file photo. Chef John State talks passionately about the authenticity of the fare for the Lunar New Year. Photo by Todd Pickering. Chef John State, head of the Lunar New Year Food and Beverage, really pulled out all the stops; some amazing food returns this year for this year's extended celebration. Disney has laid out quite a feast, and the delicious offerings are sure to please and delight everyone. State says it was a labor of love for chefs in the Disneyland Resort kitchens to learn how to prepare these new dishes. Authenticity was really important to Chef State, and his team sat down with five people from the Vietnamese community that were involved in restaurants or cooking in some fashion. The group went to three different restaurants to eat and talk about food. In talking with Chef State, we learned that the pho—a Vietnamese soup consisting of broth, rice noodles, herbs, and meat—was one of the trickiest dishes to get right. Chef State quickly learned there are different types of pho, made with beef, chicken, or even shrimp. He said that if you don't like pho just try another one because each restaurant and cook has a different style. The preparation of this dish is very time consuming, and State wanted to get it right. The Pho Bo is available at Paradise Garden Grill and is delicious. Photo by Todd Pickering. His team worked on all the dishes diligently to recreate them authentically, and were brave enough to invite his new Vietnamese friends and coaches back into the Disney test kitchens to sample their hard work. 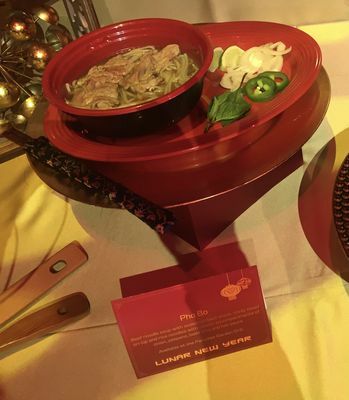 Most dishes were met with very positive reception but the pho was a "no gho." Chef State took all the suggestions and went back to the culinary drawing board... and it paid off. The broth is rich and flavorful without being overpowering, and the beef was cooked to perfection melting in your mouth. I highly recommend adding the vegetables and hot sauce into your pho bo for the traditional experience. The pho bo is one of several signature dishes available at the Paradise Garden Grill. This restaurant has become something of a rotating Festival venue, with several menu changes each year to support each seasonal promotion. Look for the return of the beer garden in the autumn, followed by a Dia de los Muertos theme, and then the return of ¡Viva Navidad! for the holidays. When asked which dish was not to be missed, Chef State emphatically recommended the Cá rô phi chiên giòn, a fried whole tilapia dinner for two. The dish is back for a second year on the Lunar New Year menu, and is possibly the most unusual meal you'll find served inside a US theme park. The whole fried fish should not be missed at the Paradise Garden Grill. Photo by Todd Pickering. State tells us it was quite the endeavor to perfect and find the best fish to serve. Presentation is everything, so the Chef opted for tilapia that stood up beautifully on the plate. The fish is served whole, accompanied by a bowl of sticky rice, two bowls of miso soup, and a fantastic lime chile vinaigrette that is definitely more sweet than spicy. Whether you drizzle or dunk, the sauce is the perfect accompaniment for the fish. Don't let the head and tail intimidate you. The preparation of the whole fish seals the flavors in, making the flesh is firm, sweet, and tender. This dish is easy to eat, as the meat falls right off the bone. You can carve a filet from each side of the fish, and find more meat around the ribs. It truly is a treat to eat, and Chef State should indeed be proud. During the Lunar New Year, Paradise Garden Grill is offering table-side delivery of most entrees. Customers order at the kiosk as usual, and pick up their drinks and a number. The food is prepared fresh and delivered to the table. A restaurant manager said the new system is designed to improve the customer experience, and make sure that food is delivered hot. To be sure, there was a wait for our entrees, but when they arrived they were all clearly freshly prepared. This year there are three food booths set up like the holidays or Food & Wine. They represent Korea, China, and Vietnam. As with other festival marketplace booths, customers order at the cash register, then bring their ticket to the booth to receive the food and drink. Shrimp skewers are available at the Vietnam booth. Photo by Todd Pickering. Chao Tom—sugar cane shrimp skewers—are made with a shrimp paste that is formed around the skewer, then lightly battered, fried, and covered in sesame seeds. The skewers are served with a sweet and sour sauce, which is not viscous and red like at some fast food places. The sauce is light and clear, and soaks beautifully into each skewer. 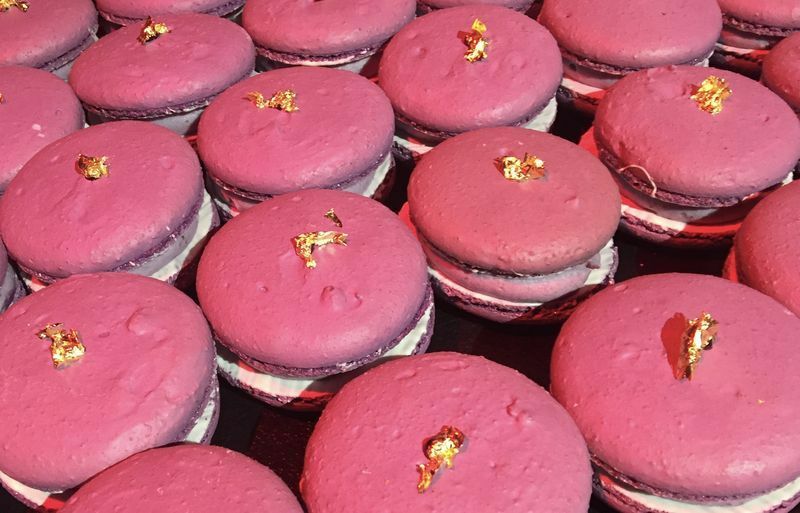 Also very popular are Banh Khoai Lang Tim (purple sweet potato macarons) that have a butter cream filling with a touch of jelly inside. 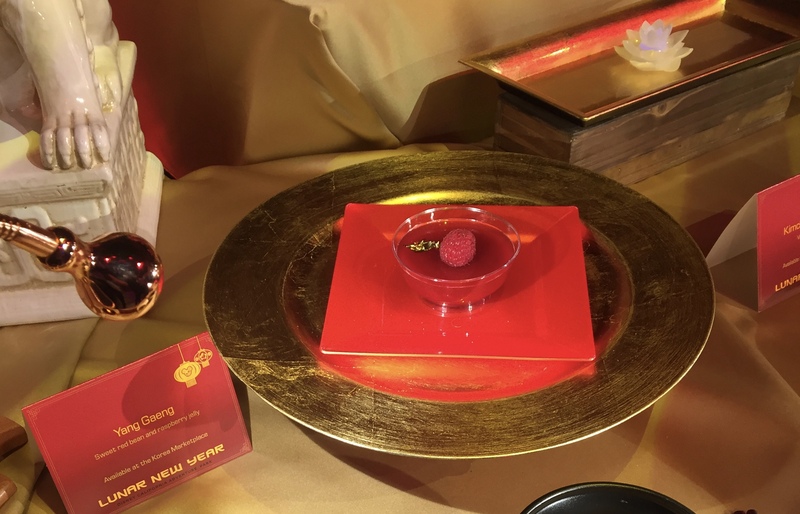 They are definitely the sweetest of the desserts offered, and have a gorgeous gold leaf on top of them. I think the most difficult treat for an unadventurous or sweet palate is at the Korea booth. Yang Gaeng is a sweet red bean and raspberry jelly. The bean paste is on the bottom with a layer of raspberry jelly above, topped off with gold leaf and a plump raspberry. You definitely need to dive down into the dish to blend these flavors, which are subtle and not overly sweet. The dish is light and flavorful, and I think it is definitely worth a try. If you fancy something lighter and not so sweet try the sweet red bean and raspberry jelly. Photo by Todd Pickering. The passion fruit green tea with lychee pearls is a sweet drink with fantastic flavor. Photo by Todd Pickering. The China booth serves up a really lovely Baixiangguo Lucha, or passion fruit green iced tea with lychee pearls. The blend of these flavors are marvelous. Each one shines through, and the passion fruit is not so over-powering that you cannot taste the subtleties of the green tea. The lychee pearls add to the melody of flavors, and even though sweet tea may not be everyone's favorite this is definitely worth a try. 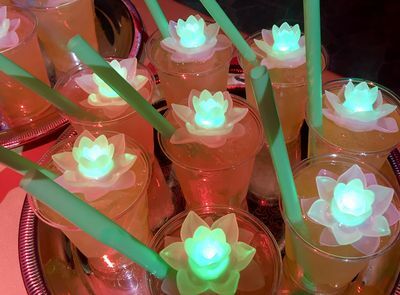 With the optional light-up flower in each drink, how can you go wrong? 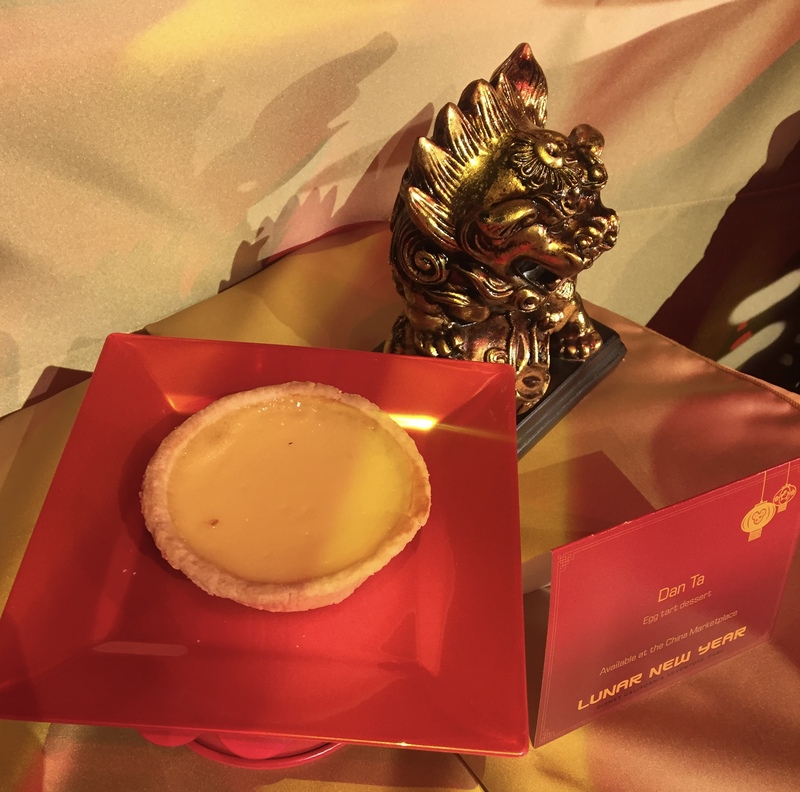 My favorite dessert was definitely the egg tart, called Dan Ta. The crust was light and flaky, the custard was not broken, and was still a bit warm as it should be. The egg was flavorful but not over-powering. It tasted like being up in San Francisco's Chinatown. Great job on this one. Egg custard is a delicious Chinese dessert. Photo by Todd Pickering. Disney expanded the Lunar New Year merchandise offerings this year by importing some items from the Shanghai Disney Resort. 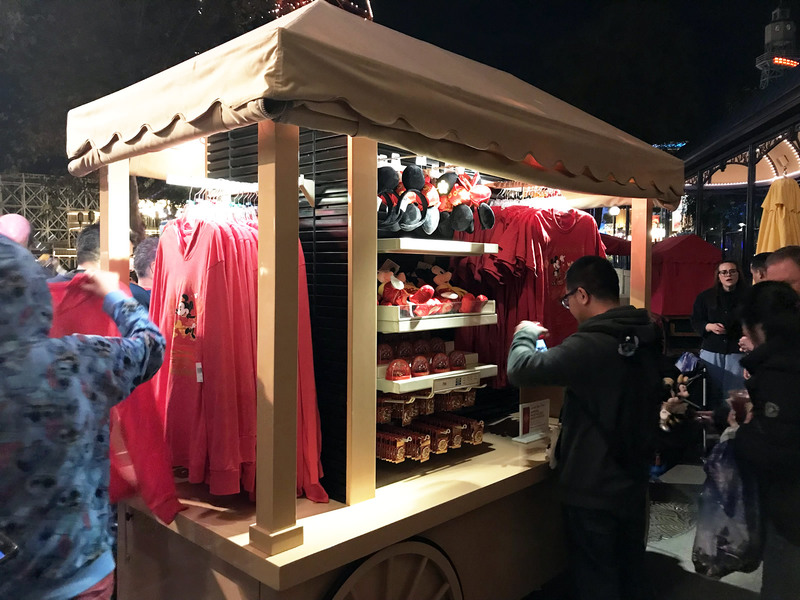 There were long lines at the festival merchandise cart Friday night, though the smaller assortment of event merchandise offered at Elias and Co. seemed largely overlooked. Reader Oleg tells us that, as of 1:00 p.m. on Sunday afternoon, many of the festival items were sold out or in short supply. He noted the Mickey Mouse plush doll, Minnie Mouse plush headband, and snow globe were sold out, and that sizes were limited on the festival T-shirt. Disney said they had no information to share about when or if the merchandise would be restocked, but we'll follow up on that. 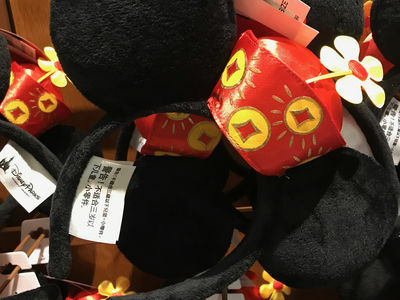 The Lunar New Year Minnie Mouse headband sold out opening weekend. Photo by Adrienne Vincent-Phoenix. Shoppers lined up Friday night to snap up headbands, plush toys, and snow globes from Shanghai Disney Resort. Photo by Adrienne Vincent-Phoenix. Nice detailed article for those who cannot make it and for those who want a preview of what to expect for entertainment, food, and merchandise! Appreciate the coverage. One comment on the food section of the article though: "His team worked on all the dishes diligently to recreate them authentically and were brave enough to invite his new Vietnamese friends and coaches back into the Disney test kitchens to sample their hard work. Most dishes were met with very positive reception but the Pho was a No Gho." Pho is pronounced as "fa", not "fo" so the play on words with the "Pho was a No Gho" is a bit, uhhh, not funny. I thought it was funny, and I treated it as poetic license because a lot of people mispronounce it as it would seem to sound phonetically in English. I've seen a number of pho places play off the incorrect pronunciation in their business name. My favorites so far have been Unphogettable and 9021Pho. That was indeed what I was going for with the BAD alliteration..... 9021Pho?....that. is. AMAZING. Thanks for sharing. I figured I was ok to do that as lots of restaurants riff on the Long O pronunciation favored incorrectly by Americans. A bit obsessed with alliteration and accents but it wasn't intended to offend. Sorry if I did so. Fantastic that folks are in the know. Thanks. I have worked in the restaurant industry and at Crabtree and EEEEEveleyn and pronunciation is always difficult. I am originally from Nebraska and chefs would NOT let me pronounce CarAmel incorrectly..... In Nebraska we say car-mel (as in Mel's Diner). That took me months to get right and now all my Nebraska friends make fun of me....you just can't win! Ha!